This week we’ve got a great Black Friday deal, we’re offering £15 cashback when new members spend £10+ with ANY of our 4600 merchants! All new members need to do to claim this deal is follow the steps below! 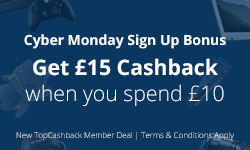 New members spending £10+ get £15 cashback! All new members have to do to claim their FREE £15 cashback is follow these four easy steps! Search the TopCashback site for cashback on 4,600 merchants. New members can spend £10+ with any of the TopCashback merchants knowing they'll be credited £15 cashback.